I recently had the chance to order a 12pk of Jones Soda s with a custom label. I had my favorite photo of my sons put on it and for the message on the back I put their names and the year. I have had their soda before so I knew it was good but it was even better with my boys photo on it ! They have tons of great flavors to pick from, I ordered the Root Beer since that is the most popular flavor in our house.The picture was great, but the root beer was delicious. It had that old fashioned flavor just like when I was a kid. This was definitely a special treat that the whole family enjoyed, and thinking about how easy it was, I know we will enjoy it again and again. The process on myjones.com was simple from start to finish. They website walks you through every step and can be done very quickly. An order is placed online at MyJones.com.You pick the flavor, image, and text to appear on your MyJones bottles. The order is reviewed. At Jones headquarters, we review your order to check for errors and ensure the content falls within brand guidelines. The order is acknowledged. Once your order has been acknowledge for processing, it is sent to our fulfillment house for printing. The labels are printed. Your personalized soda labels are processed on quality material, using state of the art full color spectrum printers. The labels are UV coated.UV coating gives your MyJones labels a durable and high gloss finish that compliments our premium product and greatly enhances image colors. The bottles are hand wrapped. 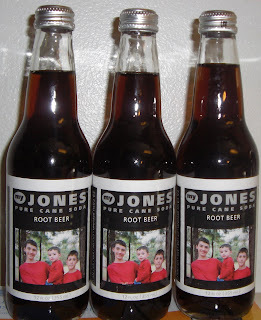 After the labels have been separated using a precision cutter, they are then hand wrapped on the Jones Soda flavor of your choice. The order is complete. The finished bottles are packaged and shipped out of our fulfillment house. You receive an email with tracking information once your order has shipped. Your order arrives and you marvel at the spectacular labels you created. You then give the bottles to your honey for Valentine’s Day, to your parents for Christmas, to your friends just because, use them at your wedding as table arrangements, give them out as souvenirs at a birthday party, display them on your mantel… the possibilities are endless. 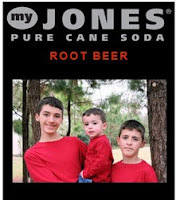 For your next family gathering, birthday party or any get together why not surprise everyone with your custom myjones soda. They also would make a great and unique gift for anyone ! Your very own customized 12-pack from Jones Soda ! Winner has been emailed, you have 48hrs to reply ! Limes with Orange sounds really good and I have a great picture of my daughter in an orange and green polka dot dress that would go perfect with the soda name. thanks! I would choose Green Apple with a picture of one of our beloved pets! I like the Green Apple and I would put my son's graduation picture on the bottle. I would choose the Fufu Berry flavor and have a picture of two of my kids put on it. Thanks. I'd get the berry lemonade, with a photo of our two sons, and send the soda to my father-in-law who loves lemonade and can't get enough of his grandsons! I'd pick the root beer with a pic of my husband with my daughter! Thanks for the giveaway! I'd choose the fufu berry flavor and I'd put a picture of my son of the bottles. Thanks for the chance. Cream Soda flavor with a photo of my sister and I to give to my mom :) Dorky but she'd love it! ;) Thanks!! I love how your personalized bottles turned out! SO cute! I would choose the orange and cream and put the kids on for Father's Day. I would get red apple because I love green apple but people said red apple is even better! I would put a picture of me and my friend from a high school football game years ago when we were best buds, then I'd invite him over to drink red apple and reminisce. i'd get our wedding photo on some fufu berry! I would like the Strawberry Lime & I would put a picture I took of my son and daughter at the zoo on it. I would get the Cream Soda and add a picture of my kids so I could give it to my dad for his birthday. We would love this. I'd choose the Diet Black Cherry and would put my daughter's wedding photo on it. I would choose the Orange Cola and use a picture of me and my twin sister just for my mom! I would choose the fufu berry flavor and put a photo of my 2 kids on the label. blue bubblegum and a photo of our crazy cat! I like Orange & Creme with the photo that we are going to use as our Christmas card this year. I've been a big fan of Jones' Soda for almost 10 years now and have tried many flavors (even their weird holiday flavors) and still come back to Green Apple! So I would order Green Apple and have a picture of my college friends pressing fresh apple cider (something we do every fall) on the bottle! Cream Soda! I love their cream soda. It'd put a picture of my boyfriend and my nieces on it, all my favorite people! I would put a photo of my girls on it and would get strawberry manilow flavor. i would get the fufu berry with my kids beach picture in it. I would like the root beer with a photo of my family on it! I would get the FUFUberry and put a picture of my nephew on it! I would give it to my sister in law for her birthday! we would get cream soda and put our x-mas photo on it for stocking stuffers! We have a big crabfeast coming up & these would be great! I'd choose the Strawberry Lime and put a picture of a crab (from our party invitation) on it! I would like the bubblegum or the fufu berry. I would put my daughter picture on it and have them at her birthday party. I'd get the cream soda flavor and add a photo of my Jack Russell Terrier to the label, too cute! I would either do cream soda or green apple, and probably put a goofy picture of my cats on it, or perhaps a picture of my family. I guess I would flip a coin to decide between these options if I won!! If they had regular black cherry, I would go for that flavor for sure, but alas, they only have it in sugar free right now. i'd get green apple because i have a great picture of me and my husband hugging and he has a green mohawk! I'd pick the cream soda and put pics of my kitties on it! I'd try the berry lemonade and put a picture of our son on it. I would pick root beer and put a picture of me and my cats on it! Fufu Berry is my all time favorite and now I have a super JONES for it! I would choose this and a photo of my beautiful, hilarious, son making one of his crazy faces :)! I really love this idea. I'd probably put a picture of my friends or something on it and the flavor? Green Apple perhaps! I love it. I'd love root beer but that isn't currently available so maybe cream soda instead. I would for sure put a fun picture of my boys on it! Orange Cola for me please! I would choose Root Beer and put a photo of my sons on the bottle. While I personally would love to try the Limes with Oranges flavor, the kids would probably prefer the Berry Lemonade. I have a photo of the girls in matching sundresses and hats, and would love that for the label. I'd like Orange & Cream flavor with a photo label of tasty fruit. Please accept my entry. Thank you. I'd want green apple, and I'd put the latest ultrasound of our baby - then I could send it to family and they'd have something to drink as well as the picture! I would choose the Berry flavor and have it read, "For My Berry Best Friends." green apple with my dog would be cute! I would choose Bohemian Raspberry with a photo of my three grandchildren on it. I would do berry lemonade as its my favorite - I would put a photo of my new wife and I and surprise her by just putting it in the fridge and waiting to see her reaction....Thanks ! i would get some root beer and put my brother's and his wife's wedding photo on it and then give it to them for their first anniversary. I would get the Rootbeer and I would put a picture of my adorable son on it. Green apple with a picture of our son. I'd pick the cream soda for my sons and get a picture of our puppy on there! I would chose sugar free black cherry and use a photo of me and my boyfriend for an anniversary present. Rootbeer with my photo on it. I would choose Strawberry Lime with our wedding picture! Berry Lemonade sounds great. I think I would use the picture of my daughter with Captain America that we took at Universal Studios. Thanks! I would like to try the Strawberry Manilow flavor and I would put my kids pic on it. It would have to be the cream soda w/ a picture of our beloved elderly beagle. I would have to go with the Cream Soda and put a picture of my 2 kids from this Mother's Day. I'd get the Berry Limeade, and have a photo of the three of us on it. What a fun keepsake! I'd like Strawberry Manilow with a photo of one or more of my cats on it. I LOVE Strawberry Lime Jones! It is my fav! I would have to put a picture of my son on it. He would think this is very cool! I would choose the Jones Cream Soda flavor and use a picture of Mt Fuji from my recent trip to Japan. I'd put a photo of my two kids on the diet black cherry! I would choose Sugar Free Black Cherry and put a picture of my family and me. I would get Root Beer and I would use a picture of me and my friend for his birthday! I'd pick Orange & Cream with a photo of my son! I'd choose The Orange Soda with a pic of my little girl! THe only digital photos I have are of my brother so it'd have to be one of those of a picture I've copied. I'd pick cream soda as the flavor. I would upload a photo my daughter took of the pets as she's so proud of that photo and she'd love it to be root beer flavored! I would choose Berry Lemonade and have my kids picture put on it. 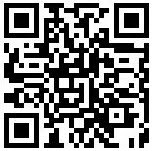 Follower on Twitter and Tweet! I would choose the Strawberry Lime flavor and put a picture of my friend on the label.